Spring has sprung, and that means saying goodbye to cold weather and hello to spring cleaning and chores around the home. If you would like to assist a senior with preparing for the upcoming season, but live far away, or you don’t have the time or the tools, send them our way. We would love to help. For those looking for ways to keep an older adult’s home safe this spring, look no further. We’ve adapted a list of important safety tasks to keep your home humming along this season (originally posted by DailyCaring here). Help spread the word about Help At Your Door to potential volunteers and clients while bagging items at the grocery store. 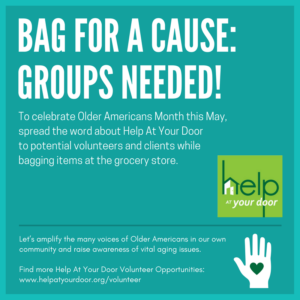 To celebrate Older Americans Month this May, Help At Your Door will be bagging groceries for customers at Cub Foods locations on Saturday, May 13th and Saturday, May 20th. Groups of 10-20 volunteers (ages 15 and over, please) are needed to fill morning (9:00 a.m. – noon) or afternoon (noon – 3:00 p.m.) shifts. Locations include Plymouth, Maplewood and Stillwater Cub Foods stores. Enjoy some quality time and physical activity with your group while assisting seniors and people with disabilities to maintain their independence at home! Let’s amplify the many voices of older Americans in our own community and raise awareness of vital aging issues. 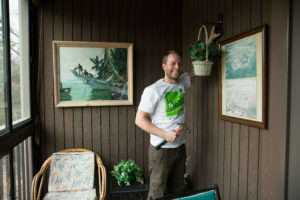 Email volunteer@helpatyourdoor.org, or call 651-642-1892 to learn more.